When buying sweet potatoes, choose firm ones with brightly colored skins. Avoid those with holes or cuts that penetrate the skin. 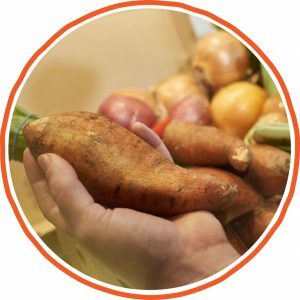 Store sweet potatoes loose (not in a plastic bag) in a cool dark well-ventilated place; avoid keeping sweet potatoes in the refrigerator. The skin can be left on (scrub well) or peeled. Slice, dice or bake whole, just like potatoes. Sauté, barbecue, fry or microwave. Serve as a vegetable with roasts, mash on own or add to potatoes. Try Sweet potato toast for a delicious low carb option. It needs a little longer in the toaster, (toast it twice) The best bit is choosing the toppings… chicken salad, tomato, basil… just go for it! 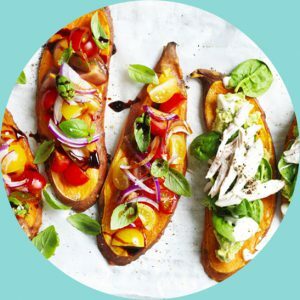 For a healthy take on potato wedges, try sweet potato wedges. Peel, slice, sprinkle with sea salt and pop them in the oven. Bake them for 30 minutes, remove then drizzle with oil. Nutritional differences between sweet potato and white potato? Sweet potato is high in vitamin A white potato doesn’t contain any vitamin A. On an equal weight basis, sweet potato provides nearly twice as much fibre. Sweet potato is 30% higher in vitamin C.
White potato provides 25% more niacin, a B vitamin needed for energy release. * Based on data from NUTTAB 2010, sweet potato, orange flesh, peeled, raw and potato, pale skinned, peeled, raw. Yes! Due to its high fibre content and high amounts of vitamins A and C, sweet potato is a healthy inclusion in the diet. It also provides useful amounts of the B vitamin niacin needed for energy release along with potassium which is essential for a healthy nervous system. Is sweet potato better for me than potato? All vegetables are considered a healthy inclusion in the diet as different types provide different amounts of nutrients and antioxidants, as well as other natural components that are likely to contribute to good health. That’s why the Australian Dietary Guidelines encourage us to eat a variety of different coloured vegetables every day. 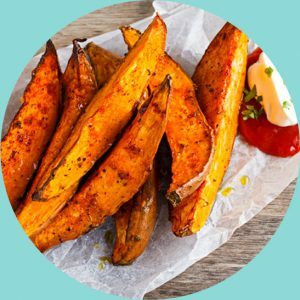 While sweet potato is higher in vitamins A and C as well as fibre compared to white potato, white potato provides more niacin and potassium so it is good to include both types in the diet. Does sweet potato contain sugar? Baked sweet potato naturally contains around 6.8g sugar per 100g. It’s this natural sugar that gives sweet potato it’s ‘sweet’ taste. It’s important to know that natural sugar such as that found in sweet potato is not a concern when it comes to our health. In fact, the World Health Organisation* states there is no reported evidence of adverse effects from consuming sugars that are found naturally in foods such as sweet potatoes. The recommendations for reducing sugar intake are based on reducing added sugars in the diet, such as the sugar found in lollies, soft drinks, cakes, biscuits and sweetened breakfast cereals. What is the best way to cook sweet potato to maintain its nutritional value? Currently the nutritional data that is available for cooked sweet potato includes baked and boiled. When comparing the two in relation to nutrient content, baking comes out slightly better, likely due to the fact that when vegetables are boiled, some of the nutrients leach out into the cooking water and are lost. However, it is good to know that both baking and boiling retain a good proportion of the vitamin C and vitamin A that is found naturally in raw sweet potato. What is the fibre content of sweet potato? One serving of sweet potato provides 5.6g of dietary fibre. This represents 18% of the daily amount needed in an average diet to maintain good digestive health. Sweet potato can be peeled and boiled. Eat simply as it is or mash with a fork which is particularly suitable for infants who are just starting solids or for older people who may require nutrient rich but softer textured foods. It also makes a great bed on which to place grilled meat or other vegetables when serving up your dinner! Mashed sweet potato is also a popular addition to white mashed potato as a way to encourage kids to get additional nutrients like vitamins A and C into their diet. Sweet potato can be baked in its skin. Baking sweet potato whole is a very convenient cooking method if you’ve just walked in the door after a long day and are looking for a quick and easy meal. Throw a whole sweet potato into the oven, then go and do something else while it cooks. Depending on the size, it will take 30-45 minutes to cook through. Split open and enjoy! Sweet potato can be roasted by chopping it into chunks and adding it with other vegetables such as carrot, white potato, pumpkin, parsnip, onion and garlic to a roasting pan. Sprinkle with olive oil, fresh herbs and pepper and bake till cooked through. Sweet potato can be sliced finely, brushed with a little olive oil and BBQ’d or grilled. What are the key nutrients found in sweet potato? Sweet potato stands out for its high content of vitamin A and vitamin C. One serving (150g) of sweet potato provides more than 100% of the daily requirements for both of these vitamins. This is particularly useful for fussy eaters who may not eat a good variety of vegetables daily and may therefore otherwise not be meeting their daily needs for these two important vitamins. It is also useful for people who are eating smaller portions and may therefore be finding it difficult to meet daily nutrient needs, for example, those on lower kilojoule diets, or those with a poor appetite. What makes sweet potato sweet? Sweet potato contains natural sugars which are primarily responsible for its sweet taste. The amount of natural sugar present is 6.8g per 100g (baked sweet potato). The amount of natural sugar found in sweet potato is similar to the amount found in other starchy vegetables such as beetroot, parsnip and corn. The World Health Organisation* states there is no reported evidence of adverse effects from consuming sugars that are found naturally in foods such as sweet potatoes. The recommendations for reducing sugar intake are based on reducing added sugars in the diet, such as the sugar found in lollies, soft drinks, cakes, biscuits and sweetened breakfast cereals.